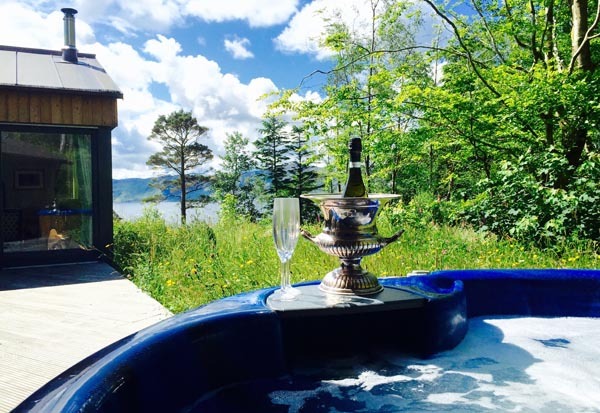 Luxury romantic very private, off-grid honeymoon getaway with hot tub. 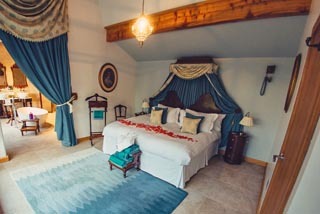 Awarded the "Top 5 Most Romantic Boltholes", The Times, Winner Best Honeymoon and Romantic Getaway Awards Spa Lux Awards and Scotland on Sunday's "Best Wild Luxury Stays for Two". Knoydart Hide offers couples or two friends (with flexibility for up to two children by special arrangement) a truly luxurious escape in the Scottish Highlands. Gorgeously grown-up and definitely private, it is the ultimate escape for couples who want to be a world away from it all - together. Very special, very different, very private, off-grid living with a superking antique canopied bed with breakfast in bed views to die for, large 360 floor to ceiling glass window from every room, stunning antique furnishings, infra red-sauna, monsoon walkman shower, italian tiled underfloor heating throughout and your own personal spa bathroom en-suite with egg shaped free standing bath and forest views from your spa. There's a floodlit outdoor hot tub, coffee machine, running machine, bose sound dock, wrap around decking, Weber gas BBQ and other special touches. It offers the perfect combination of boutique hotel styling, in-house optional massage facility and luxury self catering with unrivalled privacy and personal space. Overlooking Loch Nevis and the Small Isles, this stunning copper roof hideaway with its own wildflower meadow and ancient woodland surround makes the perfect boutique style escape. It is accessible only by boat (20 minutes by fast water taxi new purpose built catamaran across its sheltered sea-loch), so offering a very unique island-like lifestyle with everything you could wish for and more. You can go island hopping to the Inner Hebridean isles of Rum, Canna, Muck, Eigg and Isle of Skye - boats sail daily. Knoydart is a designated national scenic area and is traditionally known as 'Britain's Last Wilderness' because of its remoteness. Knoydart Hide is an excellent base to take in Knoydart's three munros; Meall Budhie, Ladhar Bheinn and Luinne Bheinn. 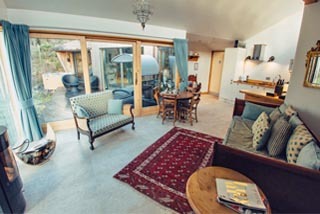 Or sit on the quiet secluded beaches, enjoy beach barbeques, al fresco breakfasts or mackerel fishing for supper. Climb Brockets Monument, learn about the last Scottish land raid, see the cairn for the Seven Men of Knoydart or take one of many organised ranger guided walks. Take the Jacobite Steam train on a return daytrip from Mallaig or visit the stunning Camusdarach beach featured in the film Local Hero. Go stalking, stroll our beaches, climb waterfalls or swim in the rivers. Watch otters feast at dawn and forest deer and stags on the hill at breakfast from Knoydart Hide. 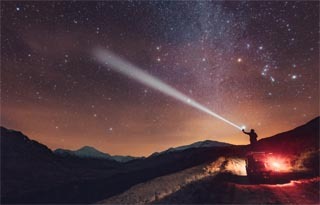 Whale watching for porpoise, basking shark, mike whale and seals make for an exciting day out on the water or relax in our hot tub under the night sky and watch the milky way overhead. Throw a log on the Rais woodburner and curl up together in your own retreat, you'll find a handpicked selection of board games, films and books for a relaxing night in together. Why not arrange to be castaway for a few hours on a remote beach or sheltered spot transferred by private boat with a pre-ordered luxury seafood picnic of fresh langoustines, crab, smoked salmon and some bubbles or a hamper of your own choice for an unforgettable celebration or private moment with someone special. 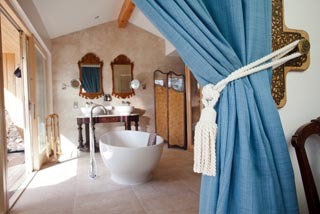 We have an in-house masseuse that can be booked for a massage in the privacy of your own hideaway luxury lodge. Port on arrival and a bottle of bubbles to enjoy in the hot tub. 4 x 4 landrover tours available on request. Just a 5 minute walk away is the multi-award winning local pub, the remotest pub in mainland Britain, with superb seafood, real ale and 10 mins walk away are two excellent restaurants as well as a cosy tearoom and pottery serving delicious hot chocolates, lattes, sweet treats and home baking for a quick spot of lunch or a lazy breakfast. 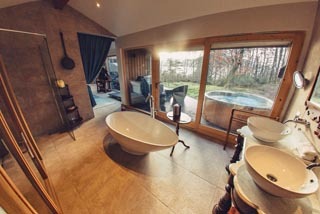 You can be as private or as social as you choose to be, proposal stays, minimoons, honeymoons or some very special reconnection time - Knoydart Hide offers true remote luxury for two. Knoydart Hide, one gorgeously grown up romantic hideaway, very private, very different for luxury short breaks under the radar. 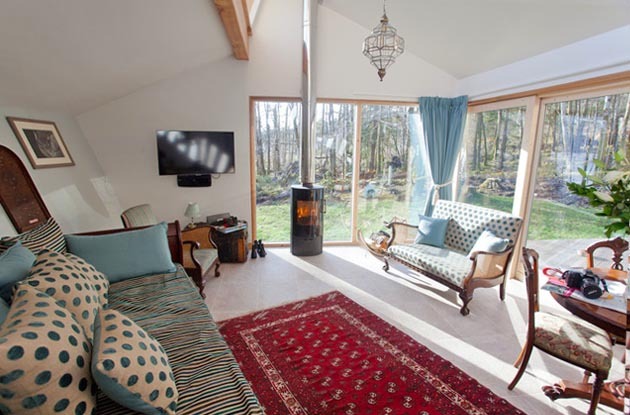 Castaway across Loch Nevis to this stunning new contemporary bolt hole on the edge of the loch set in its own private woodland on the Knoydart Peninsula. 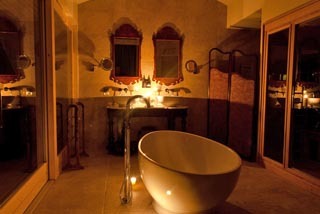 Pour a glass of bubbles and relax back in the large outdoor hot tub under the stars on the floodlit decking. Wake up to total privacy with a large en-suite bathroom or relax in the infra red sauna with large floor to ceiling glass wrap around windows that brings the outside in. Underfloor heating, 7ft bed antique half tester canopy bed, luxury robes, wood stove, BBQ, coffee machine, freestanding bath, running machine, antique furniture, Blue ray DVD player, wifi internet access throughout and bluetooth Bose sound speaker. In house masseuse treatments and in house seafood platter catering service on request, seafood to be pre-ordered at least a week before arrival, thank you. In the living area there is a stunning antique style stowaway bed with pull out second base and 2 full size single mattresses which can be configured for up to two children. Luxury robes provided for duration of stay. Port on arrival. Bottle of chilled prosecco on ice. Underfloor heating throughout is included. A starter basket of logs is provided. Egyptian cotton bed linen provided. Organic Lemongrass and ginger luxury toiletries in dispensers for guests use. Rose petals on the bed on arrival. Knoydart Hide is rented out throughout the year. Change over day is flexible. Check in 3pm check out 10.30am. Short breaks available. 2 day minimum stay, 3 days if it includes a Friday, Saturday or Sunday night. 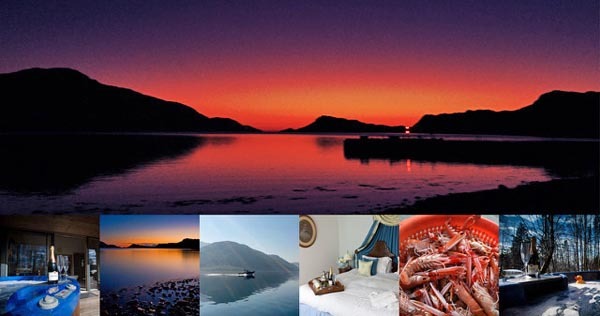 To book this unique, luxury, self catering hideaway for 2+ in Knoydart, click the enquiry button below and see availability and prices. This property offers a boutique escape for couples in a very special place with the most amazing views and every comfort provided. This luxurious hideaway with a hot tub is simply an amazing place to stay!